The steam from the boiler is led through a superheater to the turbine nozzle and the high velocity jet projected from it against the rotor creates a suction in the adjacent space which is connected to the superheater pipes or coils, thus causing a strong air current to pass through the same. The air first enters a chamber to which gas or other fuel is supplied and the products of combustion are aspired through the coils into the turbine, superheating the steam to the desired degree, also increasing the temperature of the steam through the turbine rotor and, incidentally, imparting to it some of their kinetic energy. All of these actions cooperate in raising the efficiency of the machine with the result of bringing about an important reduction of operative expense. To improve the performance of the apparatus I employ two concentric nozzles, steam being admitted to the turbine through one and the products of combustion through the other. Furthermore, in order to turn to good use the waste heat of the exhaust I attach to the latter an economizer for preheating the feedwater and fuel, thereby effecting additional savings. This invention dispenses with the compressor ordinarily required in connection with a gas turbine and will be found valuable on account of its extreme simplicity, low cost of installment and facilities it affords. Figure 2 a vertical section through one of the parts for supplying steam and combustion products to the turbine. Referring to the figures more specifically, 1 is the rotor and 2,2 the enclosing casing of the turbine which is provided with two diametrically opposite enlargements 3,3 bored out and fitted with concentric conduits 4,4, and 5,5 for supplying the working fluids to the rotor. These are equipped with, or form part of, corresponding discharge nozzles 6,6 and 7,7. The superheater consists of a steam chamber 8 closed at the ends by plates 9 and 10 and containing the coiled pipe 11, the ends of which are led out, one being connected to a combustion chamber 12 and the other to an outlet pipe 13 with branches 14 and 15 leading to the inner supply channel 16, 16. Steam inlet and outlet pipes, respectively, 17 and 18, are provided, the latter with channels 21, 21 of the supply part. Suitable steam, air and gas inlet valves, respectively marked 22, 23 and 24 may be employed for controlling and regulating the supply of the working fluids to the turbine. All the supply channels should be of a section sufficiently large so that the velocities of the fluids through them will be small as compared with those attained in the nozzles. The operation will now be readily understood. 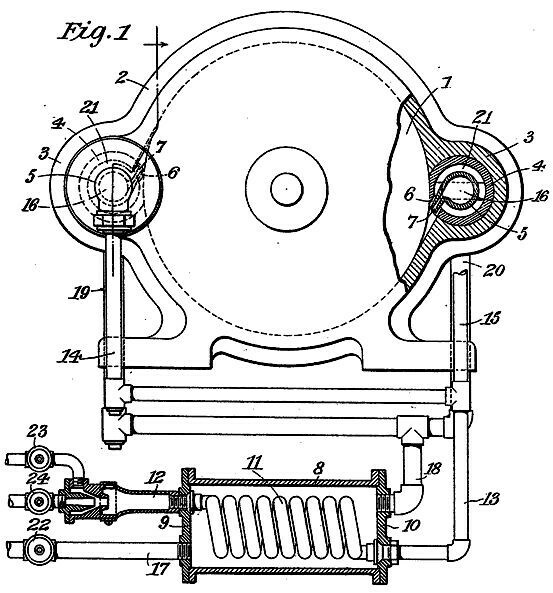 Valves 23 and 24 being closed, the steam admitted by valve 22 passes through inlet pipe 17, chamber 8, outlet 18, branches 19 and 20, spaces 21, 21 and nozzles 6, 6, setting the turbine rotor in motion thus operating the machine as a simple steam turbine subject to the usual limitations in economic performance. 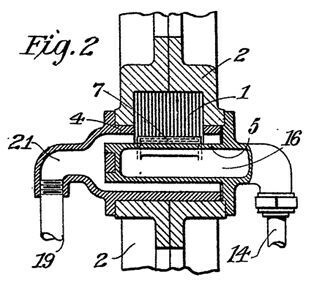 The inlet valve 23 is now opened permitting the atmospheric air to be drawn in through coil 11, pipe 13, branches 14 and 15, channels 16, 16 and nozzles 7, 7 to the rotor. Power gas or other fuel is then admitted through valve 24 and upon being ignited in the combustion chamber 12 the products pass through in like manner, assisted by their initial velocity. As a result of this action, coiled pipe 11 is heated to a high temperature and superheats the steam in chamber 8 and also in the supply channels and nozzles, thus adding very materially to the available energy of the steam, at the same time increasing the efficiency of thermodynamic transformation. The products of combustion themselves, impinging against the rotor, contribute usefully some of their kinetic energy. The economic gain effected in this simple manner will be all the more pronounced the poorer the initial quality of the steam and the higher the pressure supply. However, low-pressure steam, as that exhausted from turbines or reciprocating engines, may likewise be economically utilized by this process and means, especially if provision is made for maintaining a vacuum at the exhaust end of the turbine. The apparatus described is capable of minor modifications. For instance, the combustibles may be admitted to the rotor through the outer channels and steam through the inner ones. Again, the nozzles instead of being coaxial, as shown, may be otherwise constructed and disposed, or single nozzles may be used in their place and the mixture of steam and gases effected before admission to them. However, this can be more or less completely accomplished with coaxial nozzles, as illustrated, merely by shortening one of them. As to the superheater it may be of widely varied design and incorporated with the turbine casing for the purpose of saving energy, weight and space. Departures may also be made in the design of the combustion chamber to suit the fuel employed and the necessary adjuncts for carburetion and ignition will be provided, all of which, being well-known, are omitted from the drawing for the sake of clearness. Obviously, the process can be applied with more or less success in the transformation of the heat energy of elastic fluids other than steam. This invention provides a self-starting, compact and efficient mixed-fluid turbine and will be found valuable on account of its extreme simplicity, low cost of installment and the facilities it affords.